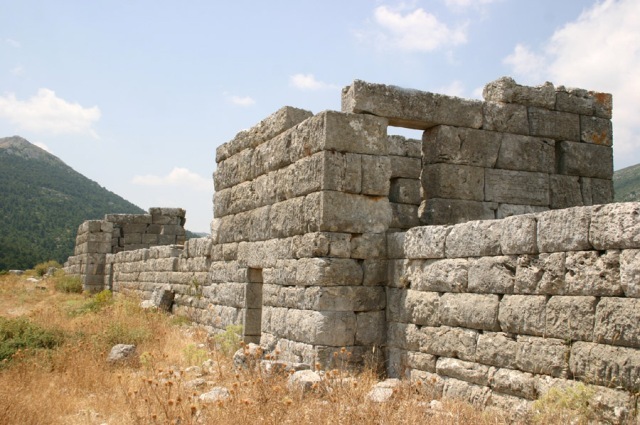 Notes: Eleutherae (Ancient Greek: Ἐλευθεραί) is a city in the northern part of Attica, bordering the territory of Boeotia. One of the best preserved fortresses of Ancient Greece stands now on the spot of Ancient Eleutherae castle and is the Athenian Acropolis, dated between 370 and 360 BC, with walls of very fine masonry that average 2.6m thick. A circuit of wall 860 m contained towers, 6 of them still standing along the northern edge of the site, preserved to the height of 4 to 6 m. The foundations of more towers are present. Although not as well preserved, the line of the remainder of the fortification circuit is clear, as is the location of the one large, double gate (western) and one small (south-eastern) gate. There are two small sally-ports located on the north side. The fortified area is irregular and c. 113 by 290m in extent.